Exhibition Extended through Jan. 27, 2019! Timed to commemorate the 100th anniversary of the American intervention in World War I, this exhibition showcases posters and flags used to stir patriotism and support the cause of war. It also explores unknown stories of New Jersey’s role in the “War to End All Wars.” These two important collections are rarely seen by the public. On the eve of World War I, President (and former Governor of New Jersey) Woodrow Wilson faced the difficult task of transforming a peace-minded American people into a populace willing to make supreme sacrifices for the country. Replete with patriotic images and rhetoric, posters used the power of illustration art to raise money for the war effort and induce change in the American mindset towards war. Forty visually-striking posters created by American artists in support of the war are featured, many designed by well-known artists and illustrators of the day. Many of the posters promoted the U. S. Treasury Department’s Liberty Loan campaigns that raised millions of dollars for the war effort. Other posters encouraged enlistment in the armed forces, volunteerism with the Red Cross, and conservation of food. 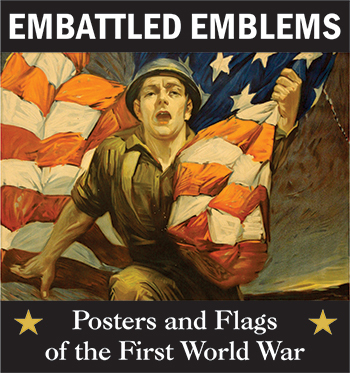 Like posters, military flags stimulated patriotism, pride and support for the war. Before leaving to do battle in France, American regiments received their official flags – known as colors. The colors returned home to Trenton after the Armistice at the request of state officials. These never-before-exhibited flags, decorated with streamers commemorating famous battles, reflect the military history of two Army divisions in which many New Jersey soldiers served – the 29th “Blue and Gray” Division and the 78th “Lightning” Division. Also included are rare flags of the 111th Machine Gun Battalion and the First Ambulance Company of Red Bank. The exhibition is part of the State’s commemoration of the centennial anniversary of American intervention into World War One, and is supported in part by the New Jersey State Museum Foundation through the Lucille M. Paris Fund.